Deric's MindBlog: Brain changes correlating with bipolar disorder. 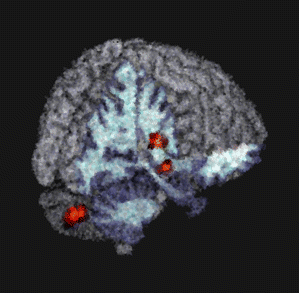 Three-dimensional model of the brain showing regions of increased volume in the insula, cerebellar vermis, and substantia nigra in individuals with genetic predisposition for bipolar disorder. The image has been reformatted in a style inspired by Vincent van Gogh, the most famous painter with bipolar disorder. For more information, see article by Kempton et al. Bipolar disorder is a grave illness causing intense mood alterations ranging from feeling depressed to mania, can even contemplate to suicide. It is caused due to genetic predisposition, high-stress lifestyle, sleep deprivation, stress filled events in life etc. Symptoms are: feeling sad, lonely, helpless, and guilty etc. If anyone are suffering from it, should discuss with close ones, friends, so it will relieve one's pain, should take help from others to prevent it. Bipolar disorder is a recent term which is generally related with depression. But still there are lot of researches going on to find out the causes for bipolar disorder. There are two ways to overcome this mental disease - therapy and pharmacology. The therapy method can continue on for years and is usually used in conjunction with medications. Medications are usually mood stabilizers that prevents extreme depression. There is increasing evidence that cognitive deficits are present in bipolar disorder (BP), but their neural correlates have not been fully explored.